THE editor of an Iranian reformist newspaper has been jailed for publishing an article on Shia Islam deemed offensive by authorities. The ISNA news agency said Saeed Pourazizi of the Bahar newspaper was taken to Evin prison on Saturday. ISNA quoted Pourazizi’s wife, Masoumeh Shahriari, as saying her husband was summoned to court but was taken to jail instead. She said authorities have demanded bail in exchange for his release. Prior to the ban, the daily issued an apology, saying publishing the article was an “unintentional mistake” and it had temporarily suspended activities to “ease the tensions”. Culture Minister Ali Janati said the article “foments religious conflicts” and that the daily had received earlier warnings. And judiciary chief Ayatollah Sadegh Larijani warned on Wednesday that his department will “act with determination against those who falsify the history and try to undermine the fundamentals of the regime”. Iran’s new president Hassan Rouhani, who has the support of reformists and moderates, pledged to work for more social freedom during his election campaign. Hassan Rouhani is the 7th and current President of Iran and also a Muslim cleric, lawyer, academic and former diplomat. Several reformist journalists and political activists in the predominantly Shi’ite country have been released since he took office in August. Bahar and several other reformist dailies, notably Shargh, only resumed publication at the end of 2012 after a ban lasting several years. The move against “Bahar” is, for some, a discouraging sign and a reminder of threats against press freedom in the Islamic republic, which has been branded by rights groups as one of the biggest jailers of journalists in the Middle East. UN Special Rapporteur on Human Rights in Iran Ahmed Shaheed said in a report issued last week that at least 40 journalists — as well as 29 bloggers and online journalists — are currently serving prison sentences in the country. The journalist said it was the eighth time a publication he worked for had been either banned or suspended. 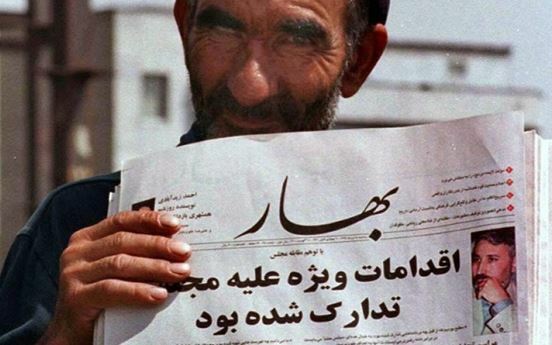 Over the years, dozens of reformist and independent publications have been banned by Iranian authorities. Reblogged this on Patriots News Source. Thanks for the link Jake! There should be enough content there to keep me busy for quite some time!